So after much deliberation, I decided that the Hund A software is simply too in-depth for my needs. Plus, it’s an extremely complicated piece of code, and it doesn’t give many hints as to how to operate it. I’ll freely admit that I’m a novice at coding, especially in Fortran. Perhaps ironic then, that I decided it would be simplest to just write my own program. 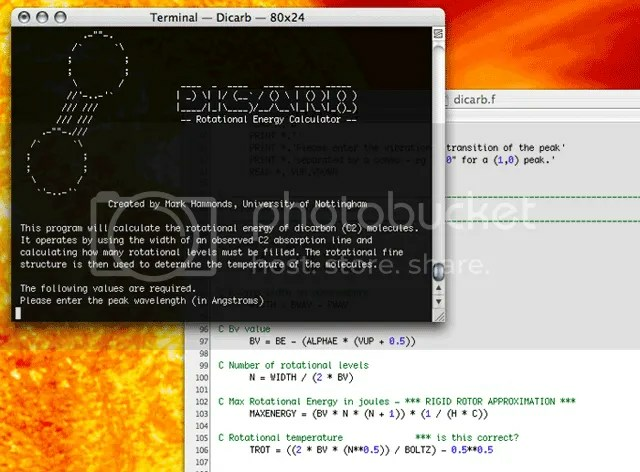 As the name might imply, Dicarb is tailor made to calculate data for dicarbon (C2) molecules. Currently, Dicarb is just a quick and dirty little program to calculate the number of rotational energy levels in a given spectral peak. That part (notable as being the easy part) is working just fine. Calculating the rotational temperature contribution from that doesn’t seem to be working so well; I’m quite certain molecules can’t exist at 3 million kelvins! Probably a mistake when I was deriving the equation. I’ll need to fix that. At the moment, I’m only calulating from the P-wing of the rotational fine structure too. At a given temperature, P, Q and R branches should all give the same result, and P is easiest here. S’funny… P-wings… I wonder how many people realise the Super Mario 3 connection there. So eventually, the plan is to expand the program to calculate the full Boltzmann distribution of all branches at a given level. In calculating the distribution I should be able to model the idealised rotational fine structure of a peak. All going according to plan, the modelled structure should match the observed peaks. If it does, then I can start using this to analyse the several hundred megabytes of nice juicy data sitting on the RAID drive back at Uni. I’m sure I probably have made/will make a bunch of mistakes in all of this calculation… But that’s half the fun of it. Besides, how else am I going to learn? This entry was posted in Imported from Livejournal and tagged computing, spectroscopy. Bookmark the permalink.